27-Jun-2010 -- Following my last trip to 32N 44E last month, I was contemplating a visit to 33N 46E next judging that since it's way out of the centre and close to the Iranian border, it would be a safe bet from a security point of view (provided that the Iranians don't take us for intruding hikers!). It could be a reporting trip to the nearby Badra oil field where Russian companies are set to start work soon. So when my colleague Leila, a fellow reporter, suggested I join her on a day trip to al-Aḥdab oil field in al-Kūt where she was to write an article about Chinese involvement in Iraq, it was too good to miss. 33N 45E would be on the way, just less than 10 km off the main road and in an area which my Iraqi colleagues said is reasonably secure. We set off at 7 a.m. from Baġdād, with Leila, her translator `Azīz, and driver Karīm heading south-east towards al-Kūt, the capital of Wāsiṭ province. We drove past the area around al-Ṣuwayra, one of the notorious areas during the sectarian civil strife of 2006-2007 where people using that main artery linking the capital Baġdād to the southern province of Baṣra disappeared on the hands of insurgents. Our driver Karīm told a chilling story about how he narrowly escaped death on that road three years ago. We arrived at al-Aḥdab oil field, about 15 km west of al-Kūt, driving through al-Nu`māniyya around 9 a.m. The area around al-Kūt is poor and desolate like much of the areas south of Baġdād, with the exception of the lush green Palm trees groves growing in the areas along the beautiful Tigris River running like a zigzagging snake in that area. The oil field itself is a Chinese fortress. China National Petroleum Corp, through its subsidiary Al-Waha, was the first foreign company since the 2003 war to start work on developing an oil field in Iraq in early 2009 though work is still at an early stage. After a quick interview of the chief Iraqi engineer, a tour of the Chinese camp followed by a visit to one of the drilling rigs and a quick chat with locals - who mostly complained of land confiscation without compensation – work assignment was completed and it was time for fun. We set off for our 170 km drive back to Baġdād via our confluence point. I told Karīm we have to be on the lookout for a dirt road to our right I spotted on Google Earth the previous night, some 10 km after the town of al-`Azīziyya. There were so many dirt roads but none looked like it would take us as far as 7-8 km off the main road. We stopped a couple of times to ask local boys about the village of Ḥawal which I could see on my GPS map, but no one ever heard of it. But they have heard of al-Qaṭaniyya, which was on the other side of our elusive road according to my GPS map. Another check with an old woman sitting on the corner of our targeted dirt road and yes, she confirmed that road can take us miles but she hasn't heard of Ḥawal either. The village along that road is known to locals as al-Hāšimiyy. We turned right and drove along a drainage ditch used as an irrigation canal called “Bāzil” or “Mibzal” in Iraqi Arabic, which gives the area its lush green surroundings of vegetation and palm trees, and dotted with makeshift pumps used by locals to irrigate their farmlands. The houses were modest, built mostly of cement brick and mud but all with satellite receiver dishes. 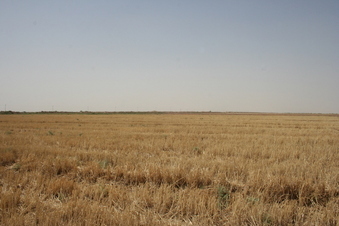 A few kilometres down, the road opened up to golden dry farmed fields of wheat and barley and nothing else. `Azīz was suddenly nervous. He was concerned about armed people or even farmers showing up in arms asking what we are doing in the middle of nowhere, on a road that leads to nowhere across their fields. But my GPS reading said we were just 3 km from the confluence point. No way am I going to turn around and go back. It just had to be done, and quickly. `Azīz suggested putting on a `Abāya (black local robe) and a head cover to look less conspicuous. I did. When the confluence point was just 200 meters to my right in the middle of a field, I told Karīm to stop. I have to walk it or even run it, if necessary, and come back. He decided to walk with me. Leila and `Azīz stayed in the car and watched. We jumped over a ditch and walked bristly across the dry field, sweating in 40 °C heat. The 200 meters seemed to be stretching as my GPS updated my location very slowly. I just wanted it to update with every step I was making, knowing `Azīz was freaking out in the car. Luckily the harvest season was finished and we were only walking on dry hay. And there we were, spot on. I even managed to get the “all zeros”. Karīm was just as excited as me even though it was his first. “This is quite an adventure, I'm up for anything like this”, he said. Too bad Leila and `Azīz missed out. We took a few pictures in the four directions and of each other and started walking back. If a farmer shows up and asks what we're doing in his field, we'll tell him I'm a researcher on agriculture checking the crops, I told Karīm. We laughed. Back in the car, two of us were feeling triumphant as we drove the 8 km back to the main road. Baġdād was just 70 km away.